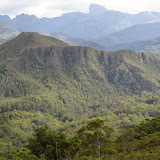 When planning for this walk we had the idea of driving to Derwent Bridge and going south from there to Mount Charles would be a good idea followed by camping beside Lake King William and doing the Alma walk the next day. When Dave heard of the plan he mentioned that he only took 1:30 to get to Charles and suggested we include Bedlam Walls as well. However we managed to drive close to Charles and so were back at Derwent Bridge much earlier than expected and decided to go on to Mount Alma. It was a steady ascent up the slope for 300 metres to the ridge top. Mostly knee to waist high Melaleuca and Tea tree with buttongrass was met on this section. At the ridge end there was a drop to a short band of tall scrub and trees back to the previous conditions, until taller scrub was gain met. After this progress became slower and at several spots we had to force a way through the mixture of vegetation, which now included some Bauera. Neville led all the way and did a sterling job of making forward progress. The effort meant that the return would be much clearer, so long as we could find the entry points into the scrub. Fortunately we did manage to follow it, again most of the credit for this goes to Neville who spotted the openings. As a result it would an ideal time for anyone to go there now before the scrub refills the gaps (see the track notes). The spot where we arrived on top was at the southern end of a plateau and it seemed that the other end some 400 metres away appeared slightly higher and so it proved to be. The views from there revealed the valley of the Plains of the Mists and north to mountains such as Gould Sugarloaf. But the scene of Mount Gell was the closest and very impressive with a big scree slope above a deep valley. Equally impressive were the mountain peaks of the Frenchman area to the south and as we descended the foreground of Junction Peak set them off nicely. looked like an area of low heathnot far from the road, but it turned out to be tall tea tree with result that the walk took 7 hours all up. Fortunately we managed to avoid anything as difficult as that. It took us just over 2:30 to get to the top and at 1:50 it was quite a bit quicker to descend. What was surprising was that almost an hour was spent on top. The walk including the summit stroll was 6.75k.